We’d love your help. Let us know what’s wrong with this preview of Maximilian and Carlota by Mary Margaret McAllen Amberson. In this new telling of Mexico’s Second Empire and Louis Napoléon’s installation of Maximilian von Habsburg and his wife, Carlota of Belgium, as the emperor and empress of Mexico, Maximilian and Carlota brings the dramatic, interesting, and tragic time of this six-year-siege to life. From 1861 to 1866, the French incorporated the armies of Austria, Belgium—including forces f In this new telling of Mexico’s Second Empire and Louis Napoléon’s installation of Maximilian von Habsburg and his wife, Carlota of Belgium, as the emperor and empress of Mexico, Maximilian and Carlota brings the dramatic, interesting, and tragic time of this six-year-siege to life. From 1861 to 1866, the French incorporated the armies of Austria, Belgium—including forces from Crimea to Egypt—to fight and subdue the regime of Mexico’s Benito Juárez during the time of the U.S. Civil War. France viewed this as a chance to seize Mexican territory in a moment they were convinced the Confederacy would prevail and take over Mexico. With both sides distracted in the U.S., this was their opportunity to seize territory in North America. In 1867, with aid from the United States, this movement came to a disastrous end both for the royals and for France while ushering in a new era for Mexico. In a bid to oust Juárez, Mexican conservatives appealed to European leaders to select a monarch to run their country. Maximilian and Carlota’s reign, from 1864 to 1867, was marked from the start by extravagance and ambition and ended with the execution of Maximilian by firing squad, with Carlota on the brink of madness. This epoch moment in the arc of French colonial rule, which spans North American and European history at a critical juncture on both continents, shows how Napoleon III’s failure to save Maximilian disgusted Europeans and sealed his own fate. To ask other readers questions about Maximilian and Carlota, please sign up. A childhood spent on a South Texas ranch, devouring the stories of the Mexican Revolution and other momentous events from the history of Mexico and the U.S. Southwest, set Mary Margaret McAllen on the road to scholarly investigation of this fascinating past. Her first two books, which garnered critical acclaim and award recognition, dealt in various ways with the intersection of U.S./Texas and Mexico. In her latest, most ambitious project to date, Maximilian and Carlota: Europe's Last Empire in Mexico, McAllen turns the focus of her research on the clash between Old World and New. Cuauhtemoc, the last Aztec emperor, was stripped of power in 1521 by the Spanish. 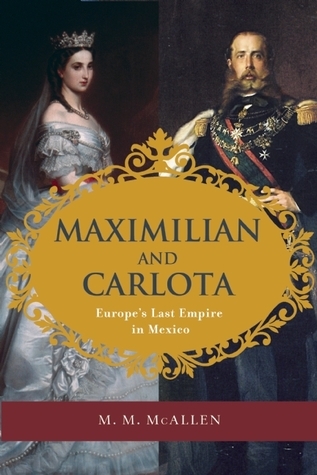 Seven years in the making, Maximilian and Carlota traces the arrival 340 years later of a new Mexican emperor, former Austrian archduke Ferdinand Maximilian von Hapsburg, who had been wooed to accept the reins of power by Mexican monarchists working with Napoleon III to wrest power from Benito Juárez and his liberal republican allies. McAllen immediately draws the reader in, building up details about Maximilian and his wife Charlotte (known in Mexico as Carlota) with engaging artistry that rivals that of historians like David McCullough. The imperial couple are both zealously earnest about wanting to bring stability and prosperity to Mexico and hopelessly naive about their chances. As they attempt to navigate the unfamiliar factions, they underestimate their ability to control the country, leading to their tragic end. The Civil War ends, and the United States threatens involvement, forcing Napoleon III to withdraw troops and funding, effectively cutting the emperor's legs out from under him. As monarchists fall to republicans on the battlefield, the emperor is arrested and executed and his wife driven literally mad. The short Second Mexican Empire ends up solidifying a sense of nationalism in Mexico and souring its people against European involvement in their affairs. In always looking for books on Mexico, sometimes I get ahold of one that seems only tangental, like this one. Lots of detail about the royal families of Europe, and lots of reminders why we don't want the rich people in power. Humble Mexico, especially in the person of Juarez, comes out with the moral highground, even with all the violence. This telling of the Empire story makes for good reading. This book discussed in detail the reign of Maximilian, a Hapsburg Austrian, as the Emperor of Mexico. Although the book was well-researched, towards the middle, I lost interest and had difficulty in completing the read. This is nonfiction which reads like fiction. A very interesting bit of history which is rarely discussed. This is a good, very informative book, but be warned: it reads like a college text-book. Very slow starting, and ends very quickly, but the middle chapters are very interesting. Considering most Americans have never heard about a French-Austrian empire in Mexico, this book is very interesting to read. Just be ready, it's not for the casual reader! Book was very informative. I knew a little about this reign and the French invasion but nothing about the actual workings of it. I especially liked the epilogue of the book. Interesting how this led to Porfirio Diaz's dictatorship later on. Good, if ordinary biography on Maximilian and Carlotta. While it is sound on the lives of the two principles, it could have been better with more attention to some of the secondary characters such as Juarez and Napoleon III. One of the greatest tragedies in history. Heart breaking in so many ways. Very well researched. Not the personal-perspective nonfiction narrative promised. Sadly, its dry, textbook reading made it impossible to finish.